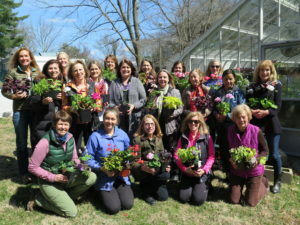 The DCA has a long history of gardening activities. Many of the original members were avid gardeners. In our earliest history, the DCA made many plant-related improvements in Darien, such as large-scale planting of trees, and the addition of flowering window boxes at the train station. Today’s gardening activities are proudly managed by the DCA Greenhouse Group. 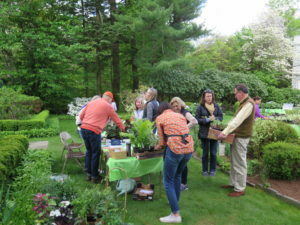 These events include hands-on workshops in our gorgeous Ellen Biddle Shipman-designed formal garden, a holiday craft workshop, and our annual DCA Plant Sale on the Friday before Mother’s Day. Click to sign up for DCA emails with upcoming Gardening Activities and more. Spring returns! Join us to divide and transplant perennials, plant containers, and prune shrubs in this annual lovely day outside on the DCA grounds. 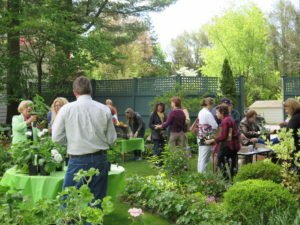 Novice gardeners will be given guidance on various techniques; experienced gardeners are welcome to just help out. 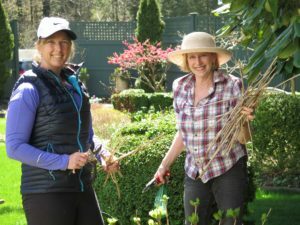 Wear clothes appropriate to gardening, and bring any hand tools you have (trowel, hand shovel, clippers; we will have extras if you don’t). Afterwards we’ll enjoy a light lunch on the patio. Children are welcome under your supervision. Reservations are requested to ensure there’s plenty of lunch for all. Unique and unusual selection of 1,500 mature plants. All plants grown in the DCA greenhouse and members’ gardens. Expert personal advice from Greenhouse Group members.